Not a long par-4 to start with, but requiring precision from the tee. A bunker on the right at 215 metres catches many drives as do the trees eating in to the fairway on the left. The right to left and downhill slope rewards a well-struck draw shot, hit down the right half of the fairway. The second to a green, which falls slightly front to back and left to right, must be flown over bunkers at the front both left and right. A very well designed driving hole. The fall of the land is left to right and bunkers on the right at 215-240 metres catch the ball hit in the centre of the fairway. Driving too far left makes a very testing second shot across the left to right lie of the land. The perfect tee shot finishes just left and past the bunkers leaving a straightforward second. The approach is uphill to an elevated green with bunkers on the left and right. Following the same contour lines as Hole 3, this hole has a left to right slope on the tee shot. A ball started a little too far left catches a fairway bunker. Yet one too far right (while it will lie well), is blocked out by a clump of pines on the right. The second is to the green with bunkers left and right and severe slope from the right side of the green. A slightly uphill tee shot has a very well placed trap at the corner of the left-hand dogleg. Trees on the right catch the player who dislikes the look of the sand on the left. The slightly uphill is a little longer than it looks, bunkers at the front left and rights catch those who under club. Great examples of the short, yet testing par-4. The drive must be struck between a cluster of fairway bunkers on the left and pines on the right. The fall of the fairway is left to right. Many do not attempt the driver here. The second shot to a green-bunkered front and back and with another tantalising tier running across it is a test of length judgement. It is easy to over hit the green. A safe entrance is on offer on the left side, which then leaves a testing putt. One of the best par-5 holes in the world of golf. The drive across a shallow depression with the beautiful Loulé hills as a backdrop, is an ever-narrowing gap the further you hit. Bunkers left and right at 220 metres demand accuracy from the tee. The second shot, slightly uphill, is to a long green, bunkered left and right and with another tier running across the centre of the putting surface. Three good shots are necessary to make an "easy" par-5 here. A slightly downhill par-3, usually against the wind. The green is raised slightly above fairway level and is surrounded by bunkers left, right ant at the rear. Less testing than Hole 14, this still demands a well struck accurate shot. A testing par-4, usually against the wind. The drive from an elevated tee must be placed between fairway bunkers on the left at 200 metres, and tree on the right positioned on a ridge, which can leave an uphill lie for the second shot. The green has an easy approach, but is bunkered to the back left and has a fall from the back edge. A slight tier across the centre of the green ads zests to the putting. A friendly tee shot with bunkers to the right at 200 metres and a fall slightly away to the left, sets up a test of distance judgement for the second, with a short iron. A large trap at the front of the green, another on the left and a bank on the right, make a high soft approach a must. The green has subtle interesting contours. Driving through a winding, picturesque avenue of pines towards the Loulé hills, this is fine par-5, just in range of two long well placed shots. Bunkers left and right at 210 metres make accuracy a must on the drive. A generous fairway offers plenty of room for the second shot, but clusters of bunkers left and right catch the wayward strike. The green is surrounded by traps in front, left and rear, and has a 2-metre bank to the right. The green has a tier running from 8 o'clock, left to right across the green, necessitating an approach from the correct angle to get near the flag. 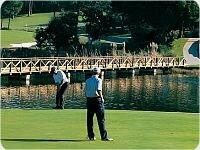 A spectacular hole with a three-acre lake around the left-hand side of this 90-degree dogleg. The lake begins at 150 metres out from the tee and extends along the left side of the fairway and along the left edge of the green. A bunker at the right centre, extreme end of the fairway is the driving line - usually with a fairway wood or long iron. The second shot is intimidated by the water hazard on the left and a large trap along the right of the green. 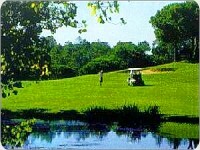 Aqua phobia often makes the unwary over hit the second, leaving a long putt across a large undulating green. A drive of over 200 metres is needed to see the bottom of the flag on this testing driving hole. A bunker on the right (at 210 metres) makes length and accuracy a must to set up a short iron approach. A trap on the left hand banking to the right make this long green no "give-way" to hit. A great par-3 hole played from an elevated tee, giving exposure to the wind. This medium length par-3 features a figure "eight"- shaped green with a tier across the waist. Bunkers left and right, and banks front and rear, make this very good test wherever the flag is positioned. A 90-degree right dogleg which does not always require a full drive shot. A bunker centre left at the corner of the dogleg catches the over hit drive. The second uphill to an elevated green with trap on the right is, again, slightly further than the player sees. A slightly downhill par-3 from an elevated tee. The green is set in a bowl on a bank and once enough length is achieved, many balls will roll onto the green from the left, right and rear. A short dogleg left par-4 that again demands a precise shot. Many hitting a drive slightly right or too long end up in semi-rough. Those going too far left can catch a bunker or roll over the banking left of the fairway into an amphitheatre of pine trees. The second to a green bunkered left and right needs to be well flighted and, woe betide the player who is long or left. Again a demanding drive. This time across a lake which is a 190 metres carry from the Championship tee. The fairway, sloping right to left, can lure the player into the left-hand fairway traps at the point of the right-hand dogleg. The second down into a dip and onto the steep slope up to the green offers a generous fairway but trees catch those who miss it. The approach up a steep bank to a sloping double tier green, must be well thought out as putting down the slope is never easy.